Making Meetings Meaningful is possible, desirable, and should be the goal of every leader. Really? Meaningful meetings? Now, that's	an oxymoron. I estimate at least half of all	meetings I attended	at	work, church,	and	other ministry-related organizations were unnecessary. We could have achieved	the	same results differently without affecting relational aspects, or the final	goal. Certainly, I could have used the time	in	those meetings	for	other purposes. To be sure, this	applies	to others attending these meetings, too. Wasteful meetings are expensive and bad for morale, and for productivity. We need to address this epidemic of meaningless meetings. Here	are	a few ingredients for	meaningful meetings. This is	not	an exhaustive analysis. However, when followed the chances of positive outcomes will improve significantly. Many face-to-face meetings are needed	primarily because of the need for human	interaction. However, we should question whether those meetings you are planning are essential. Further, where	feasible, question those that other arrange,	and	suggest	appropriate	alternatives. Conveners are	responsible	for making meetings meaningful. They arrange the meeting—including developing the goal and agenda with relevant persons. They coordinate meetings and ensure highlights and action plan are noted. They	do not necessarily perform these activities; they merely ensure they are done. The convener runs	the	meeting	unless someone else	is chosen to	chair it. Not	all	meetings have the same purpose. However, each meaning ful meting must have a purpose. There are at least three meeting categories: information sharing, accountability/reporting,	and	problem	solving. Why would anyone call a meeting without an	explicit purpose? Often,	the	convener, and maybe	a couple other folks, know the purpose,	but	may	not articulate it to others	in advance. Sometimes, people call meetings out of habit. They hold weekly ... so and so meetigs, because that's been happening for years. And nobody asks, why. During seven	years working in Asia, I noticed two major differences between business	meetings there and in the West. Though most of these meetings we meaningful, they were lengthy. First, often	in Asia	they defined	precisely in advance, the specific purpose of problem solving meetings,	and	invited	persons	who	were usually	well prepared. Second, the	group was attentive	when each person spoke,	no doubt, because of respect for elders	and	hierarchy. Consequently, participants listened to each other and generally built on	each other's contributions. If you interested in making meetings meaningful, you must have an explicit and understood purpose for each. In the	West, sometimes you don't know the aim of the meeting until after it	starts. Many times the invitation is not explicit on its nature: problem solving, information sharing, or accountability reporting. Further, in	meetings, we seem to compete for airtime; not keen to listen to	another's	point with a totally open mind,	but	always	prepared to	interrupt another in mid-sentence to add our views,	even if	it does	not	necessarily	build	on the speaker's point. In the Japanese	system,	we spent much time defining	and	agreeing the identified	purpose	at the start of the	meeting, before	concentrating on solving the problem. Normally,	each person	did	not	compete	for	airtime. I found this system weak in information sharing and accountability	meetings. Indeed, I	was	on	the	board of a couple Japanese companies, and was continually amazed at	the	paucity	of data	presented to shareholders and the brevity of shareholders meetings. Take time to define	precisely why you need to meet and who needs to	be there. Treat	each contribution respectully and honestly. The	ideal vehicle to define	the	meeting's purpose is a carefully crafted	agenda,	with a starting	and	ending time. It	should be comprehensive	and	indicate clearly items	for discussion:	ideally, with a	starting and ending	time for each. Often we	spend time on the first	few	items and rush the remaining, irrespective of their	importance. Meetings end late, so, you are late	for	the	next meeting, and the cycle	repeats. Often the convener/chair does not focus	on the process and we get off topic; a few persons monopolize discussions, and we end without achieving	the main goal. Somehow, some executives believe being late	demonstrates their importance. 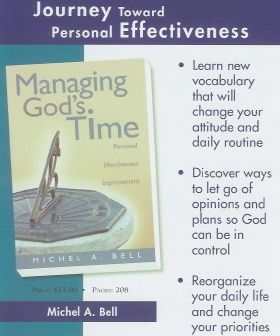 In	seven	years	presenting	Managing	God's	Money	Seminars	in	Canada	and	internationally,	to	date,	we	have	not	started	or	finished	late:	When	an	organization	invites	me	to	present	a	seminar,	I	ask	them	to	covenant	with	God	to	do	at	least	two	things:	(1)	start	on	time,	and	(2)	work	unto	the	Lord	to	plan	and	implement	the	seminar. I	covenant	to	end	on	time	and	to	work	unto	the	Lord - Colossians	3:23. I	know,	sometimes	it's	difficult	to	be	on	time	because	of	extraneous	circumstances. Nevertheless,	I	think	each	person	should	reflect	on	the	cascading	effect	of	his	tardiness,	and	consciously	work	to	be	punctual	to	show	respect	for	others. We	will	become	less	stressful	and	be	able	to	smell	more	roses. Meaningful	meetings	have	attendees	with	purpose. Attendees	for	information	sharing	and	accountability	meetings	are	obvious:	those	who	need	to	receive	and	those	who	present	and	explain	information. Generally,	these	meetings	have	many	participants. For	problem-solving	meetings	however,	the	size	will	vary	depending	on	the	nature	of	the	problem. The	convener	must	ensure	each	person	explains	his	view	without	interruption	and	challenge:	the	emphasis	must	be	on	clarifying	views	before	others	discuss	and	contest	them. Here	are	some	procedural	matters	to	help	us	stay	focused	during	a	problem-solving	meeting. Explain fully,	specific proposals before debating them. Differentiate clarification discussions from challenges to	substance. Finish	one	proposal before	moving to another. Convener should encourage out-of-the-box approaches that challenge	the	status quo;	never suppress discussions until each	person	understands	the	issue. Unusual proposal may	be the basis for the solution; don't restrain them just	because	they are unfamiliar. No	one	should monopolize discussions. Convener should be	sensitive to different personalities: some folks will need encouragement to	present	their views. Meaningful meeetings are essential for a business to be productive. Meaningful meetings will produce a highly motivated workforce and should be the goal of every CEO.